Wedding bouquet, along with other accessories,It completes the image and emphasizes the individual style of the bride. Modern floristry, unlike the old days, is at a new level. Now it offered more alternatives to the traditional bouquet created using not only fresh flowers, and ribbons, stuffed toys and other materials. 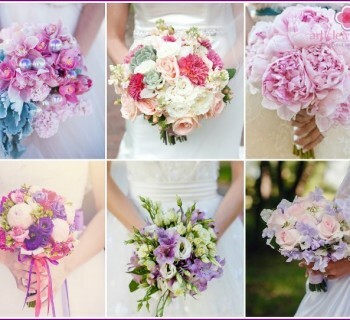 What can replace the traditional bridal bouquet of flowers? If you want something to replace the standardbridal bouquet, you can safely turn on the imagination, try something original and new. Complete composition of chili peppers or berries - so you can make an unusual alternative to a bouquet, not much moving away from tradition. There will also be appropriate: bracelet, barrette, a ring and a lot of other products that replace the standard accessory. For a winter wedding, and it is not worth to spend money on fresh flowers. Replace them with beautiful fur collar, decorated with jewelry brooch, it is more practical because the heat gives hands. If the wedding is scheduled for the summer,the bag or fan can act as an alternative to a flower arrangement. Do not be afraid to express individuality and to create a bridal bouquet with the help of buttons, beads, sea pebbles, seashells, ribbons or candies. This is your day, and who does not like you to decide what it will be. No matter, will have a masterpiece or not - most importantly, that the bouquet will be made with your own hands, which means that no one in the world that does not happen. This beautiful bud volume created withusing rose petals, gladioli, lilies and other flowers. Usually glameliya out small, that as an alternative to the traditional colors perfectly petite brides. However, if desired, a bouquet, bud can do more, so that it looked harmoniously in the hands of the model of growth of girls. Creating glamelii requires certain skills,therefore it is better to turn to an experienced florist. Different petals are fastened to each other by a special glue, threads or wire. After that, the collected bud preselected shape prick on the frame and is decorated on the outside. Note that this alternative to the standard fresh flowers will only last for one day, then it should be done in the morning of the wedding day. Umbrellas, created with fresh flowers,as an alternative to the traditional bouquet, look very romantic and original. They endow the bride charm, tenderness, enliven the wedding photo shoot. Umbrellas are used not only as an accessory the bride, but also as a decoration for the tables when you make a banquet. You can cover the entire upper part of the flower, or umbrella to decorate his part. Combine with live buds of large feathers, beads and satin ribbons - so you create a stylish accessory that will decorate the wedding. 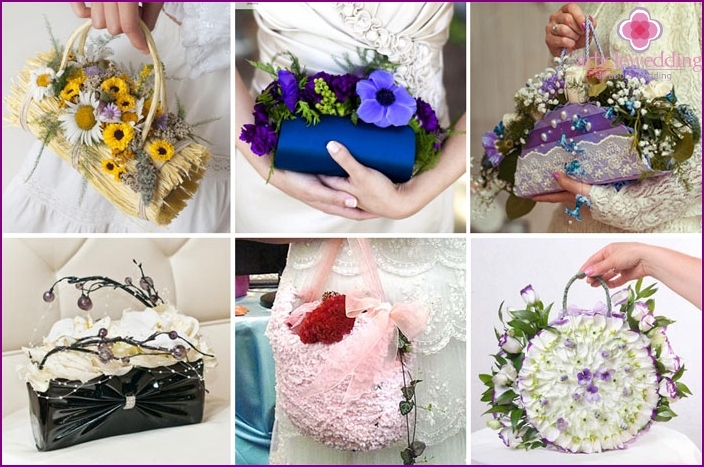 Become popular latelyextravagant bridal handbags bouquets. So florists take care not only about the attractiveness of the image of the bride, but also of giving the standard accessories of the original species. They are decorated with fresh flowers handbag that looks very elegant. Such an alternative embodiment of a bridal bouquet definitely not be left unattended audience. Despite the fact that these bags can not be considered practical, as a decorative element, they are not competitors. In exceptional cases, a bouquet-bag can beand used for its intended purpose, carrying out its usual role. However, the main decoration of a bouquet alternatives still remain flowers. 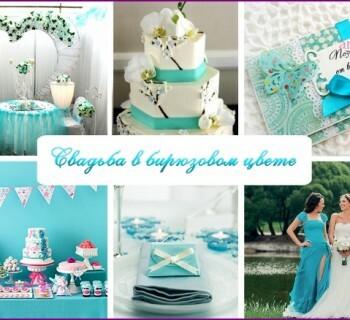 The girl should choose them according to their way, then they will look harmoniously not only with the dress, shoes and jewelry, but also in the general concept of a wedding celebration. Wedding bouquet in the form of a fan before seemed tovery strange attribute of the bride, but not now. This accessory provides an alternative to traditional girl the opportunity to be original. 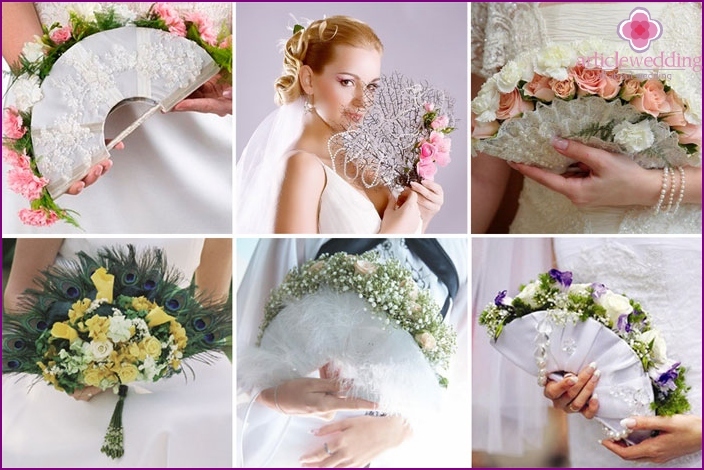 Therefore, many newlyweds prefer to have the wedding in their hands was a fan of fresh flowers. This ornament can be ordered from the florist, or create your own - decide for yourself. No matter which option you choose, the thing will look spectacular and certainly will be remembered for guests. Gently, romantic and original looksbridal bouquet of ribbons and feathers. It perfectly complements the image of the bride and attract admiring glances to her guests. If you choose to create an alternative to the usual flower arrangement, boldly decorate her beautiful brooch, beads, or beads. This creation, be sure guests are unlikely to see another wedding. The big plus is the bouquet that he did not wither in the next day or even a few years. Traditionally, the bride must have weddingbouquet, but there is nowhere stated that it must be a flower. Young may choose to create an alternative embodiment of a composition with other materials such as soft toys. Such a thing - a guaranteed way to distinguish themselves and attract attention. Cute teddy bears in suits honeymooners become a kind of symbol of your wedding and future family life. Is there an alternative to the tradition of throwing the bouquet? The transfer of the bride with a bouquet of ribbons,as an alternative to the traditional throwing of colors, it has gained popularity recently. 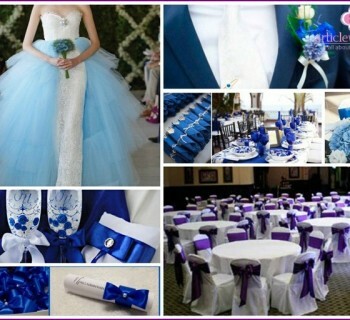 If you also want to hold such an event, please be long ribbons of different colors or a single color in an amount equal to the unmarried girls at a wedding. 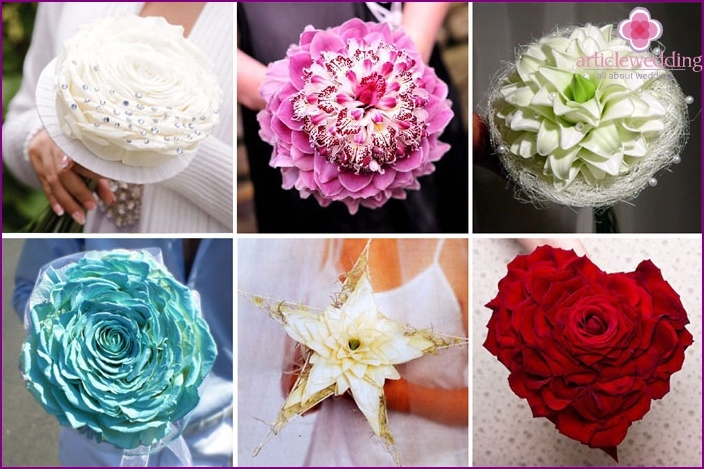 The bride should tie a ribbon to the stem of the bouquet, the other is free to squeeze in your hand. Each will choose a girlfriend let the tape, and after you file a specific signal, all the girls have to pull on the ends. The one in which the tape is attached to flowers, will become its owner. Ask your friends to write their names onPaper sheets of paper, put them in an opaque container and remove one. The girl, whose name is written on a piece of paper selected will receive flowers. This will be an excellent alternative to the traditional throwing of the bridal bouquet. Instead of leaflets with the names can be used personal belongings unmarried girlfriends. The bride can hold an auction - this is anotheralternative wedding throwing flowers. To do this, choose a traditional wedding attributes, including the bouquet that the bride will present at the sale. Money raised during the competition, the couple can spend at its discretion: to give to charity, go on honeymoon, to buy lovely gifts to family and friends. The competition is sometimes used asAlternatively, the transfer of the right to marriage by the bride's girls without second half. The fun lies in the fact that the wedding flowers are closed on the lock in the trunk or box. Free girls distributed keys. That single, whose key fit the lock, can pick up a bouquet of himself. The second option - you can prepare as many chests as you have girlfriends (if the material condition). Then each will be able to open the box and get a specific bouquet.